↑ २.० २.१ २.२ २.३ २.४ २.५ २.६ Corporate Sustainability Report 2013. 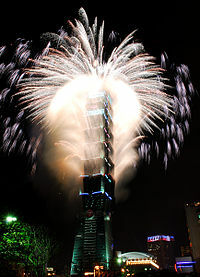 Taipei. 2014. ↑ ३.० ३.१ ३.२ ३.३ ३.४ ३.५ ३.६ ३.७ ३.८ ढाँचा:Emporis. Retrieved 25 March 2015. ↑ ढाँचा:Skyscraperpage. Retrieved 25 March 2015. ↑ ढाँचा:Structurae. Retrieved 25 March 2015. ↑ Observatory brochure, Floor 89, Taipei 101. 17 August 2007. ↑ Keith Bradsher. Taiwan Close to Reaching a Lofty Goal. The New York Times. 11 January 2004. Retrieved 25 March 2015.